These elevation data sets were derived from LiDAR data collected in 2004 by Merrick and Company and in 2007 by Woolpert, Inc. The data are available as raster Digital Elevation Models (DEMs) and as Triangulated Irregular Networks (TIN) in two different formats. 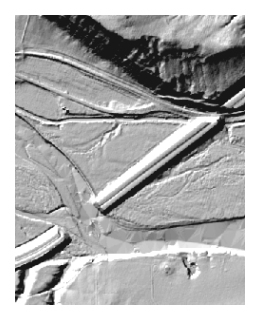 These Digital Elevation Models are stored in TIFF format and have a horizontal spacing of 2.5 meters. Triangulated Irregular Network (TIN) data are available in two formats. The data files are large, ranging in size from 200 to 1,600 megabytes. If these files are too large for you to download, please contact us and we will send you the data.